I always love the time of year between Christmas and New Years! For me, it’s always been about reflecting and goal setting! It’s a chance to fill in my new planner and examine my priorities! I have been writing my goals out since the high school days and LOVE to pull them out from their secret hiding spots and see how much I have or have not accomplished. I think goal setting is a must do for success. Goals keep me focused and on track, and while I do spend a good amount of time planning for the new year, I spend even more time reflecting on the 12 months prior. Looking back really helps me to look forward. The last 12 months have been full of all sorts of life!! Sometimes good, sometimes scary, sometimes fun, sometimes really really crappy! But all of that color makes life beautiful. My Dad’s cancer diagnosis reprioritzed many of the goals I had originally penciled out around Thanksgiving time last year! Dad became my goal list’s top prioroty in all caps, highlighted boldly. Getting him better, and helping Mom through it all, was simply what mattered most. Keeping life as normal as possible for my kids and husband was my next priority and because nature has always been my solice, we found ourselves enjoying many adventures and quality family time in the beautiful outdoors this past year. 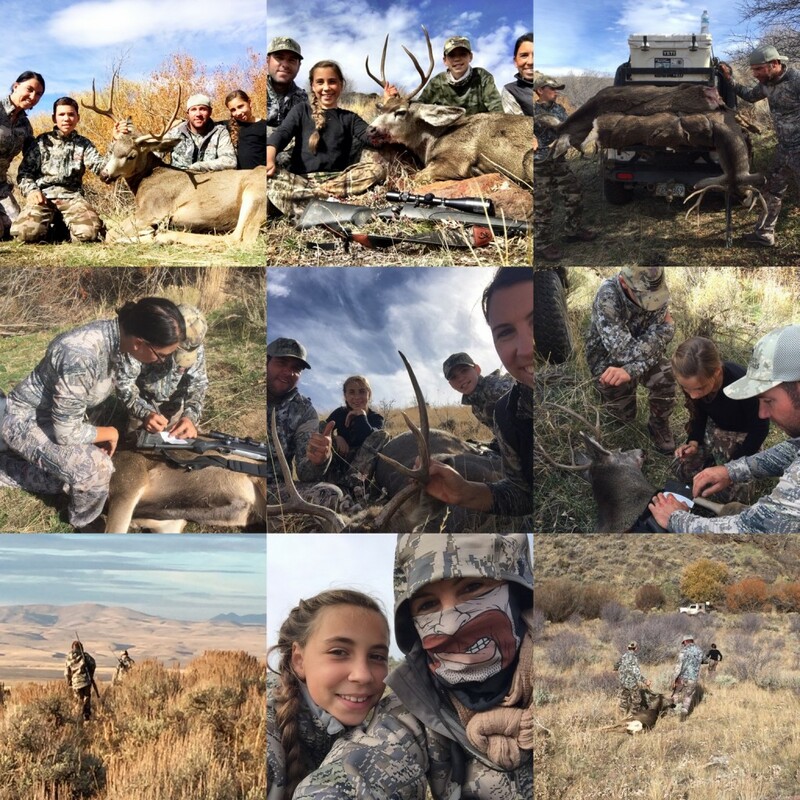 Our biggest highlight of the year, and quite possibly my life so far, was our family mule deer hunt to Idaho this past Fall. It is funny to look back and see the 180’s and crazy ups and downs that can all happen in one year’s time. 2016 was full of experiences both great and absolutely horrible. Things you would never want to go through again, while others you wish you could replay over and over! Some day I may write about my Dad’s cancer battle, but for now I’d much rather end my 2016 blog posts by sharing the best of our past year! 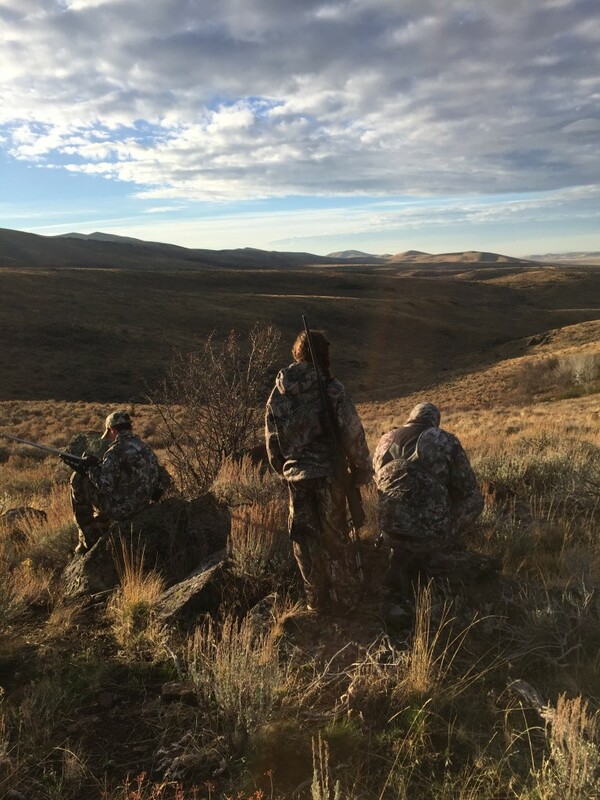 Casey sat down, not long after that hunt and best day ever and wrote a pretty nice story about our family’s mule deer hunting adventure. I thought his story would make the perfect last post of the year and I hope we will have many more outdoor adventures to share in the upcoming year! Cheers to 2017! Thanks for following the blog. I’ll be outlining some of my goals in a new post soon. Which includes blogging more! Until then, I hope you enjoy this story and remember to live long in the outdoors! We grew up hunting deer in california and expanded our hunting to many western states over the last 20 years. My wife Regina and I have taken many bucks over the years and have watched as friends and family have taken others, however, this year’s hunt was off the charts! This was to be our kids first big game hunt! 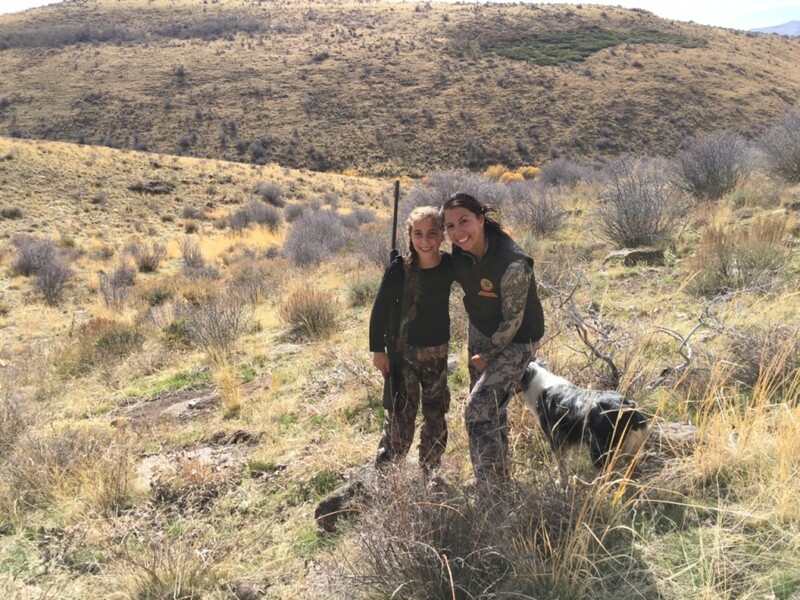 Two years ago Idaho changed their minimum hunting age to 10, giving my kids the option to apply for tags this year! In early May We sat down with our son Cade, who is 11, and our daughter Quinn, who is 10, and began the application process and submitted our applications. Now the waiting game started! As the draw dates drew nearer we check the website daily waiting for the draws to come out. Finally they did and we were all excited to see the kids had each drawn a tag! The house was alive with excitement and we began our planning and preparation for the big hunt! Now that we had tags in hand, my wife Regina and I started working to get the kids geared up and ready for the hunt. Several trips to the range and countless online orders of new gear and we were finally ready to go! The trailer was loaded and we hit the range one last time to make sure the rifles were dialed in before hitting the trail. Cade decided to shoot his grandpas .338 as it was fitted with a killer muzzle brake and he shot it well out to 500 yards. Little sister on the other hand hates loud guns and is scared of the kick so she chose to pack the .17 fireball. After countless shots at the range we were all confident she could get the job done as she shot it with pin point accuracy out to 200 yards! As we pulled out of the driveway on the afternoon of October 23 I am not sure who was more excited, Regina and I or the kids. We hit the road with smiling faces and couldn’t wait for the adventure that lay ahead. The season was open and we were on our way! We pulled into camp at 1:00 pm the next day after a long night of driving and got camp set up in time for the evening hunt! We left camp around 3:00 and headed out for the evening hunt. Within minutes we spotted a nice 3 point buck but he gave us the slip so we kept after it. We covered a lot of country that first evening, putting a lot of time behind the glass. A half hour prior to dark we spotted a nice 3 point and the stalk was on. Quinn and I came up with a game plan and headed out. Within minutes we had cut the distance to 100 yards but as darkness approached we couldn’t find the big buck, just a few smaller ones that Quinn passed on as she said they were too small for the first day of hunting. I was proud to see we had taught her right and she was committed to taking a nice buck. We traveled back to camp in a thunder storm and took refuge in our trailer for the night. After a big lasagne dinner we hit the sack, all wishing daylight would come soon so we could get back into the field. We were up and and running prior to daylight to get to our first glassing spot. We searched high and low but couldn’t turn up any tag worthy bucks. We saw some small ones and several does but just couldn’t find any decent bucks. The deer were up early and in bed quick. We searched high and low to no avail. That evening we searched some new country with the same results. Lots of elk and a few deer but nothing we were looking for. That night we decided we would look at some lower country the next day and if we couldn’t turn up and good bucks we would move camp and try another are we have hunted in the past. We were on a glassing point prior to day light and were again seeing elk and a few deer. With a quick move to another canyon we quickly spotted a good buck and Cade and I set out to try and close the deal. The buck was down in a hole with a bunch of does and a few smaller bucks. We closed the distance to 100 yards and still couldn’t see the buck as he was down in a hole. A few more feet of belly crawling and we could see him! Cade got set up on the sticks and was waiting for the does to clear and give him a shot. Within seconds the does cleared and Cade settled in for the shot. As he clicked the safety off I heard it off to our left and coming quick! The unmistakable sound of a herd of animals running our direction. You could tell the deer could hear it to as they all looked up hill. 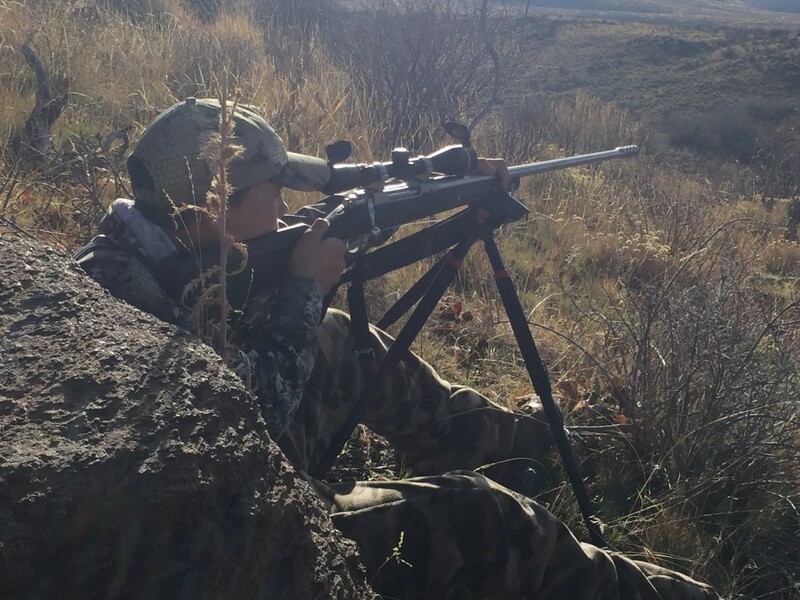 The safety was off and Cade was leaning on the trigger but before he could squeeze it off the elk ran right between us and the deer, and blew the deer out of the canyon! We had a eye on the deer and watched as they piled into a patch of quakies down the canyon. We watched to make sure they stayed in the trees and continued our stalk. As we closed the distance the deer made their move out of the trees and into the next canyon without presenting a shot. We gave chase and we’re soon scouring the canyon walls in search of the buck. 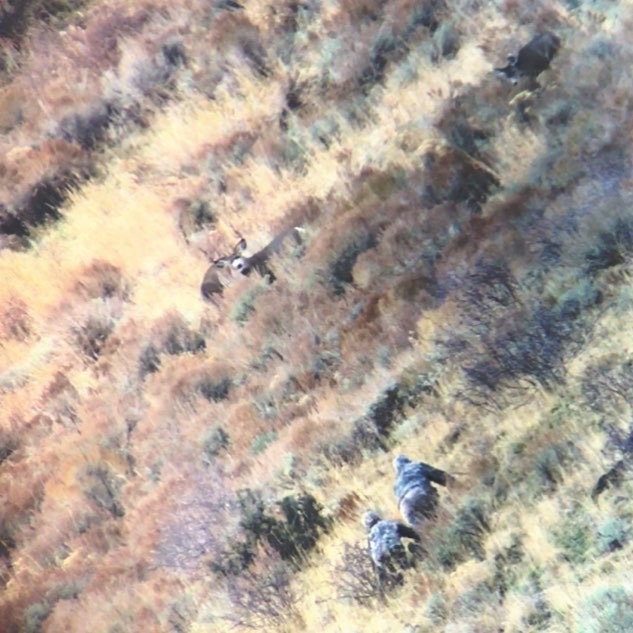 It didn’t take long to notice movement on the other side of the canyon, and after a quick check through the binoculars revealed a couple more great bucks! We were over 1,000 yards away, but the deer had no clue we were there so we made our move. We closed the distance to 400 yards and found a perfect rest so we got set up and Cade readied himself for a shot. The bigger if the two bucks walked into the trees but as he came out in the open Cade was ready and let it rip! The shot went high but the buck didn’t move. Cade quickly racked in another round and got back on the buck. I could see the frustration on his face but told him to just settle down and take his time. He got back on the buck and as he squeezed the trigger the buck stood up on his hind legs and dipped over backwards! He had just taken his first ever deer and a damn good one at that! You couldn’t have knocked the smile off of either of our faces as we sat there soaking up the moment. We quickly snapped out of it and sent mom and little sister a text saying big buck down! Within seconds Regina was on the phone telling us to wait for her and Quinn as they wanted to be there when Cade first got his hands on the buck. While we sat waiting for them we continued glassing looking for a buck for Quinn but only turned up some does and smaller bucks. Cade and I moved down the ridge a bit to get a better vantage point and both saw a two track road that ran under the ridge he had just taken the buck on. Cade wanted to go straight to his buck but we talked about it and decided we should walk several miles back to the jeep and drive around to the two track so we could bring the buck out while, he hesitantly agreed to listen to his dad and we set off to intercept Regina and quinn. After reliving the story with them we all made or way back to the jeep and piled in to drive around and get our hands on Cade’s buck. As we made our way down the two track to get below Cade’s buck we looked up the canyon on the opposite side of the road and spotted movement. It was a buck and one that quinn wanted to try for. We quickly crossed the creek and made our way up hill towards where we had seen the buck last. The buck had dropped down into a draw so we crept forward ever so slowly trying to spot him before he spotted us. At last we caught a glimpse and got Quinn set up on the sticks and ready for the shot, the buck was 175 yards and I knew she could make that shot. The only problem was the buck was walking straight away from us and wouldn’t stop no matter how loud I whistled or grunted. The buck was now getting out of her effective range so we took off walking straight at him as he was waking away and quickly cut the distance to 130 yards. Quinn got down on the sticks again and the buck turned broadside, game one! She found the buck in the scope and tried to calm herself but the buck fever had already set in!! We quietly talked back and fourth and she calmed a bit and said “dad I’m ready”! Shortly after the safety came off and as she touched the trigger the buck dropped in his tracks! It was a perfect shot and quinn had just taken her first buck! It was all hugs, high fives, and smiling faces. Regina and Cade joined us within seconds of the shot going off as they had heard the tell tell smack of the bullet. We all made are way to Quinn’s buck and watched as she put her hands on her very first big game animal a beautiful 3 x 2 mule deer. Regina and I were both very proud of her and watched as she smiled uncontrollably and told Cade the story. After a quick photo session we packed the buck down to the jeep, as Cade was starting to get a little testy and really wanted to get his hands on his buck. We made our way up the steep hill and as we neared the flat where Cade’s buck had been I could see him, and handed Cade the binoculars and told him to take a look. The buck was down for the count as we all raced up hill and watched Cade as he grabbed ahold of his first buck! His buck was a tall heavy 3 x 3 and again we were all smiles. Another quick photo session and we were headed downhill with Cade’s buck the whole time reliving the story of each if there hunts. What a perfect day! Back at the jeep we got both kids together with their bucks and got a couple hundred photos, which the kids got a little impatient with, but will be happy to have as they grow old! Hands down this was the best hunt Regina or I had ever been on and those deer might as well have been 30 inches wide in our eyes! The feeling of sharing your children’s first successful big game hunt was beyond words for me. It was a special hunt in a special place to us. I had hunted this unit for the first time many years ago with my uncle Rick Stafford and had taken my first mule deer buck here. Since that first trip I have been back every time we have been fortunate enough to draw a tag and have been lucky to spend many days in this unit with friends and family! My uncle Rick passed away two years ago now and while he is greatly missed I know he was there with us that day on the mountain!